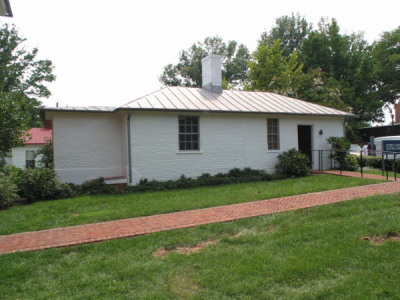 Oral tradition and The Virginia House Tour claim that Dawson’s Row #3 was originally James Monroe’s slave quarter for his home on Monroe Hill. An 1856 letter establishes that a slave lived either in or near the parsonage. Since this building is located next to the former parsonage, it is possible that the building housed slaves at one time, or served as some other type of dependency. Anna Barringer’s memoirs mention a two-room house next to the parsonage as being the oldest building on the grounds and the former overseer’s cottage for the Carr’s Hill Plantation (presumably meaning Monroe’s property, as Carr’s name became associated with Carr’s Hill after the Civil War). In 1977, the building's name was changed to honor Luther Porter Jackson, a leading African-American historian who taught at Virginia State University. Originally, Dawson’s Row referred to a series of student dormitories (individually identified as A, B, C, D, E, and F) erected in 1859 using money from the sale of Dawson Farm. House G was built several years later. In 1912 and 1913 the area around Dawson’s Row was leveled and graded so that level ground and terraces with steps would connect the plots with each other and with Minor Hall. The dormitories were demolished, several at a time, between 1931 and 1953. Records from the 1940s refer to the buildings remaining in the area of Dawson’s Row by number, e.g., Dawson’s Row #3.